An Escapist denizen made a flash game based on a joke made by Graham Stark in an episode of ENN and it's really fun. Stop the presses! I think we found our Game of the Year. In October, the trademark for the word "edge" that Tim Langdell of Edge Games has been vigorously protecting for years was finally overturned by a California court. Our own source for entertainment news, the Escapist News Network's Graham Stark was pleased by this turn of events. Now he could finally move forward with a game that he'd held on the back burner for fear of Tim Langdell's overzealous lawyers. With Langdell's trademarks no longer a problem, Graham told co-anchor Kathleen DeVere that he could finally move forward with his game Edgey McEdgerson's Hedge Edger. A fan of the show made the leap and actually designed a flash game with Graham's idea. 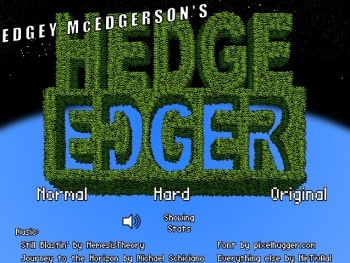 Hosted at Kongregate and designed by NirTivAal, Edgey McEdgerson's Hedge Edger is exactly what you'd expect. You play as Edgey McEdgerson and leap from the top of hedges while poppy dance music plays. In that way, it's reminiscent of Robot Unicorn but the difficulty ramps up as Edgey goes faster and faster. It's a simple game, but it's really quite fun. I'm not sure what Graham Stark thinks about the game, or the fact that someone took a quick joke of his and turned it into a reality. I, for one, think it's hilarious and give kudos to NirTivAal for pulling it off.